Instead of teaching coordinate quadrilaterals throughout the quadrilaterals unit, like I normally do, I taught it all together. It worked. I don’t know if it was better or worse than doing it throughout. The first day, I only taught about proving a quadrilateral is a parallelogram. 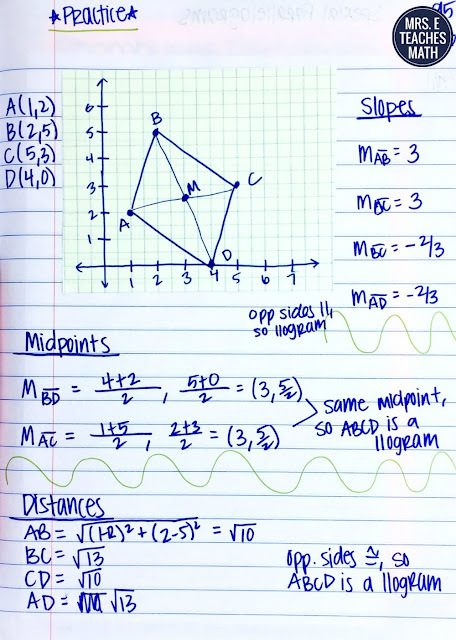 Before I started the lesson, I gave all of my students a sticky note and had them find the formulas for midpoint, slope, and distance and write them down. They stuck it on their desk and referred to it during the lesson. 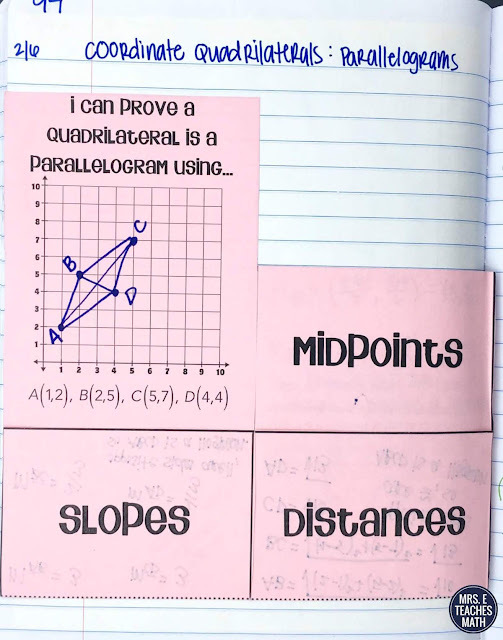 I felt super fancy with the foldable I used for this lesson… partly because I used an “I can…” statement on the foldable, and partly because I used a shutter fold, but kept one flap up. I also feel like the way I have a flap for each formula takes any guess work out for the students. Under each flap, we worked the example, using that method. So, when my students had their homework they could mimic the work under the flap. On the facing page, I gave students a scrap of graph paper. I gave them the four points in the margin and had them draw the graph. The worked with their partners to prove it was a parallelogram using all three methods. I honestly didn’t have to use the graph, but I think it helps them visualize things better. 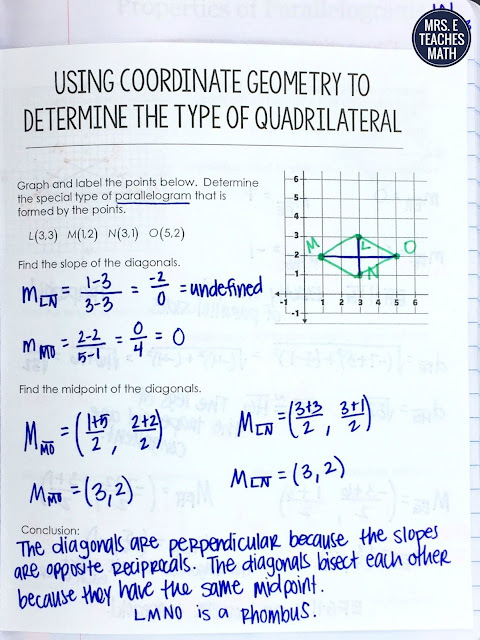 The second day, I taught students how to determine the type of quadrilateral, using coordinate geometry. Some of these problems take up so much room (if you want things to be organized), so I used a giant hamburger book. 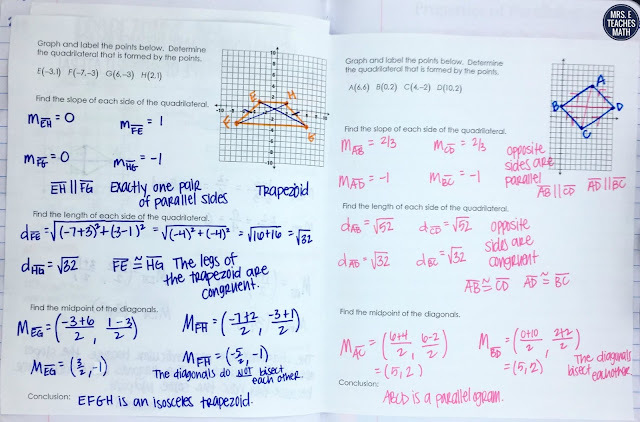 There were three problems in this book. 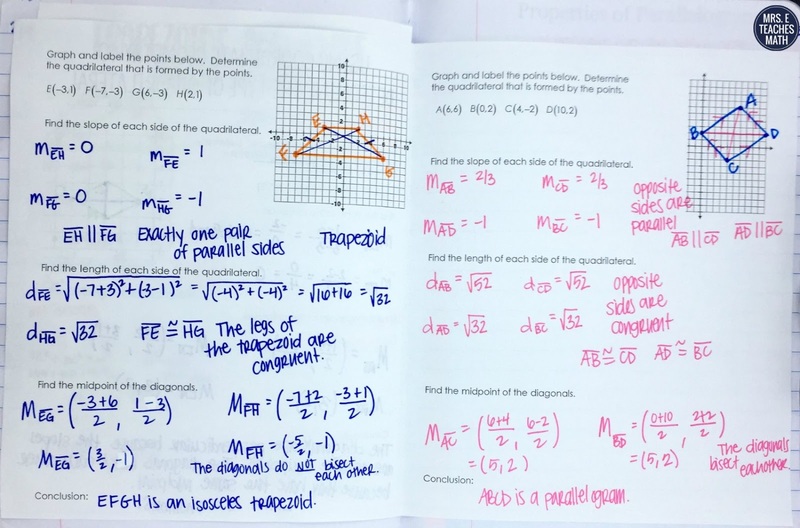 It took almost the whole class period to work the three problems - that could be because my students worked slow. The third day, I had my students do a stations maze to practice their coordinate geometry. They worked on it the whole class period. I haven’t decided if I will teach it all together again next year, or if I will do a little at a time throughout the unit. Good thing I have time to decide!